Time to make a crisp. I am not a peeler of peaches by nature; I consider it both healthy and rustic (read: less work) to leave the peels intact. But there is a little person in my family who spits out any morsel of peach peel she finds in her mouth, or, worse, squirrels them away in her cheeks to spit out later. I didn’t relish the thought of finding a pile of masticated peach peel in a corner sometime next week, so: peeled peaches. A few precious handfuls of those blueberries piled in with the peaches turned the whole thing purple and sang the summertime harmony line. I compared recipes and discovered why I love Rustic Fruit Desserts so much; that book’s recipe called for more than twice as much sugar as Deborah Madison suggests for the same quantity of fruit. It was quite unnecessary in this case. I split the difference by winging a less-sweet fruit filling, dressing the fruit up instead with vanilla and cinnamon. The decadence of the crisp’s almond-flecked topping more than masks any hint of austerity in the filling, however. And a melting spoonful of vanilla ice cream on top would be just fine here. 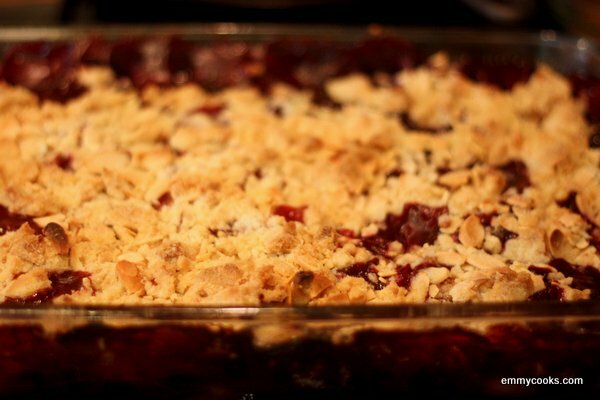 Peach and Blueberry Crisp: To make the crisp topping, combine 1 1/4 c. flour, 3/4 c. sugar, and 1 tsp. salt. Cut 1 stick (4 oz.) butter into cubes and use a pastry blender or food processor to cut the butter into the dry ingredients until the mixture becomes crumbly (it should hold together in large crumbs when you squeeze a handful). Stir in 3/4 c. sliced, toasted almonds, then place the topping aside in the freezer while you prepare the filling. 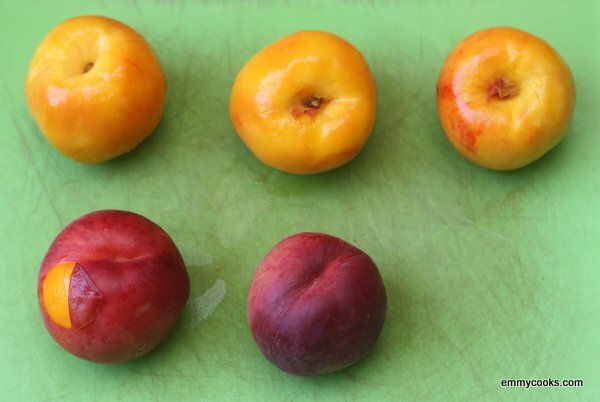 If you have your own reasons to peel your peaches, it is easiest if you dip them in boiling water for about 10 seconds first; the peels should then slide off easily. If you skip this step, I won’t tell. In a large bowl, rub together 1/4 c. sugar, 3 Tb. cornstarch, 1/2 tsp. salt, and 1/4 tsp. cinnamon. Slice six peaches into wedges and place them and their juices in the bowl, then gently mix everything together with 2 c. blueberries and 1 Tb. vanilla. Pour fruit into a buttered 9×13 baking dish and scatter topping over fruit, squeezing each handful a bit first to create large and small crumbs. Bake at 400 for 4-55 minutes, until the fruit is thick and bubbly and the topping is golden. Cool a bit before serving with vanilla ice cream. Try to save a bowl for tomorrow’s breakfast. Sounds delicious! PS You could peel peaches the same way as tomatoes (cross, hot water, cold water). I just tried this, and it works like a charm. I’m also not a peach-peeler, but it seemed to me a good idea to peel the peaches before using them in pie filling. Good to hear. I agree, pieces of skin can be a problem in a pie. Now that has to be a good thing, and summer is just around the corner for us! We just bought a ginormous box of local peaches. Smoothies, a forthcoming pie, our morning fruit salad and yes, just reaching into the box and snagging one. I adore peaches! One must overdose on them while they are available. We just had the “to peel or not to peel” debate in the household – I was for peeling since that’s what my mom always did, but perhaps I should rethink. Yum! 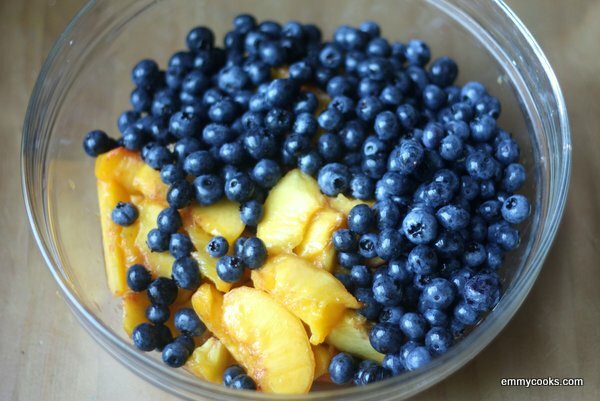 Love the combo of peaches and blueberries. Beautiful pictures Emmy! Love nothing more than summer peaches…we too ended up with a giant crate of them from Eastern Washington and have been eating them to our hearts content. At least your little one will eat a peeled peach…I’ve got a little guy over here who won’t even eat that! Ah well, more for me! I would not peel a peach either. The skin is yummy! Great post thanks! This sounds so tempting! I’ve never tried making a crisp with this particular combination before (having only warmed up to peaches– vs. nectarines– in recent years, though I’ve always been partial to blueberries), but now it’s on my list! Just made a peach and blueberry crumble last week. Oh man- soooo good. There was a recipe my kids ate!